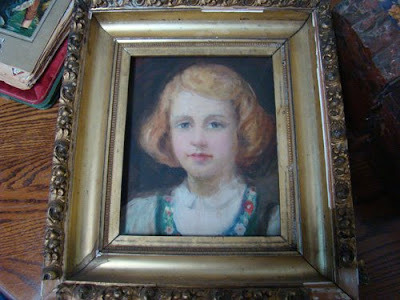 My Auntie Bea was a painter, working in the 10s-40s. This is a painting she did of my sister Carol. My brother wrapped it for me to take on the airline, and did a very poor job of it. The frame got ruined on the trip, but at least the painting wasn't ruined. When Dinah saw the painting she stared and stared. "Now I know I really am related to you", she told me. We don't look at all alike, but Dinah looks a lot like this painting of Carol. Dinah left for college today. Not the happiest of times for me. I've read a letter at my mother's from Eleanor Roosevelt to Auntie Bea, who was painting a portrait of FDR. In the letter Eleanor complains that they don't like the nose. Geez. Aristocrats! I have two other paintings by Auntie Bea. One is of nymphs playing music in the woods, in an American Impressionist style, and one is a lovely miniature of my mother at about two years old. That's a lovely, haunting painting. Your aunt painted for the Eleanor Roosevelt? Wow. My relatives never did anything like that. You come from a talented family. You've probably heard of George Cruikshank (who also had a talented family). Are you related? This is a beautiful painting and a wonderful story! The Roosevelts! and they were complaining! Wow, lovely, and as namo said, quite haunting. The Roosevelt's! Wow! I'm experiencing college-related turmoil right now myself. I'm actually on my laptop during my morning pre-class wait (and this laptop is hard to top on, the keys are weak for some reason). Some guys are playing pool nearby and repeatedly screaming "son of a...!" and "biscuits!" I'm starting to really burn out on college in a massive way, and I'm thinking about looking at other options. I feel very overwhelmed by it all. I've done well (I just transferred to OU from my old school and got a scholarship for my previous success) but I really hate the school experience and I'm not sure my sanity can last much longer. I have a film class, the "class goal" of which is "to construct an argument to support your prediction of the future of film." What is the point of that?! I'm very glad you're back. These blogs cheer me up! ^hard to type on, not top on. Geez. I need to proof-read more often. This is a wonderful painting and a great story about your Auntie Bea (especially about the nose). Can we see the miniature of your mother some time? I sure wish Auntie Bea could've seen Quasi. Great painting and stories. I'm confused though. If Eleanor and Franklyn didn't like his nose, why didn't he just have plastic surgery? Docs have been fixing noses a long, long time. overwhelmed by travel/house duties, but thanks for comments. a wanderer, I have a lot of thoughts about college, pros and cons, and want to post about it, but it will have to wait until I'm in Colorado. The drive is only one day. Linda, by the time I got around to trying to photograph the miniature the light was all wrong. Maybe tomorrow, or maybe you'll get to see a goat picture tomorrow. Namowal, I don't think there's any close relation to George C though I love his work, and he's sometimes credited with inventing the comic balloon. No rush, I'll be checkin' round. I'm sure you'll be happy to be back in CO.
My spirits are raised anyway, a very dumb little movie my friends and I made just got accepted in a new local film festival (the fest is new, the comic book convention it's a part of is 28 years old)! So there's something to look forward to to get me through the unpleasantness anyway. I know you are nervous about Dinah going off to college. It may help you to know that she is just a little bit safer this year than she would have been last year, thanks to the Higher Education Bill which was signed into law recently.